In the 2007 gubernatorial election in Edo State, the people needed a leader who is bold, courageous, serious and determined to unearth the roots of the profound problems of structure that faced them. Then came the quintessential, brief in stature, intellectually robust and extremely popular labour leader, Comrade Adams Oshiomhole who decided that he would cut off the toes of the powerful and offend the poor in order to bring about a transformation in Edo State by seeking to restore the Edo State master plan. In doing this, he dismantled the apparatuses of privilege replacing it with a dynamic social organization that was designed to provide the channels of opportunity for those who desired to engage in genuine enterprise and in so doing create an atmosphere of equal worth and a sense of pride in all the streams of the ethnic origins of Edo people. The people saw in a very short time how one man could completely change the character of a state and the industry of its people. In the past, Edo people had leaders who lacked the political will, the inclination, and the confidence to tackle very simple problems in the state and they were genuinely amazed that there were indeed solutions to their problems. Adams Oshiomhole often stated that the worst thing about poverty was its cyclical nature in which the children of the poor frequently inherited their parent’s lack of opportunities in life and so were themselves practically condemned to a life of poverty. His postulation which caught the fancy of the people was that this cycle of poverty would go on with the talent of millions of people going to waste with an endless continuation of the suffering that poverty brings leading to the establishment of a dynasty of the poor with products of the dynasty usually found in motor parks as touts and ready thugs for use during elections. He attempted to break this cycle of poverty with various youth empowerment schemes and the creation of a conducive environment for private enterprises to thrive. In the eight years that he served governor of Edo State, the people were relieved of the recklessness and arbitrariness that characterized previous administrations in the state. There was a better tolerance of political opposition and the expression of alternative political viewpoints. In the process it was certainly not an easy task to clean up the state which suffered from decades of neglect and misgovernance. The achievements recorded by the Comrade governor in the state did not come as a surprise to many people considering his eight year tenure as the number one labour leader in Nigeria, a period which was characterized by purposeful leadership, an insistence on good governance and a reinvigoration of the Nigerian workforce to a level never witnessed in recent history. As president of the Nigerian Labour Congress, he demonstrated a thorough understanding of the collective yearlings of the Nigerian workers apart from the fact that he was not associated with any godfather when he decided to plunge into the murky waters of Nigerian politics. Indeed he fought godfatherism to a standstill in Edo State and he had to quickly disband the rainbow coalition he put together after the titanic legal battle to retrieve his mandate when it became clear that those who made the previous government fail in the state were determined to undermine his resolve to transform the state and take it to new heights. In Nigeria, we have a legacy of dysfunctional political process marked by executive dominance and political corruption. This has created a “godfather” political culture that sees government mainly as an instrument of personal power and accumulation of private wealth. This was the situation in Edo State before Oshiomhole’s ascension to power. The “godfathers” were intolerably powerful and were unimpeded by law. Their hold on power made them acquire more wealth and, therefore, more power to the detriment of the poor suffering masses of Edo State. This obviously made the transfer of power in an orderly manner difficult in 2007 leading to many months of legal battle after the massively rigged gubernatorial election. Some few months to the inevitable end of Adams Oshiomhole’s tenure as governor of Edo State, the polity was heated up because of political realignments. 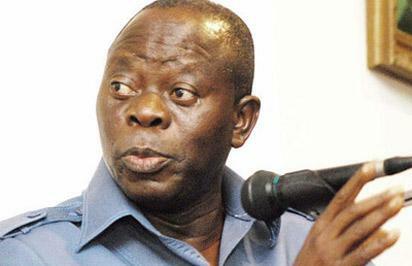 Comrade Oshiomhole was however helped on this matter by the fact that the majority of Edo people perceived the defections of some former APC members to the PDP then as an elite contestation for power with nothing to do with the interest of the common people and the “fight” being merely a planned return to the “elite” or “oligarchic” arrangement of the pre-Oshiomhole involvement in Edo politics. Edo people were scared of the recurrence of old patterns in their political life in the state. During the period, Oshiomhole continued to maintain his position on the need to consolidate on the monumental infrastructural revolution he started in Edo state in the face of suggestions that he planned to foist a political lilliputian on the state after his tenure. Before the 2015 general elections therefore, there were ominous signs of a simmering political tension in the state over who to succeed Oshiomhole. This continued till the twilight of his administration. In coming around the ensuing political conundrum in Edo State, the Comrade governor realized that making progress was about making politics work because politics determines the choices we make. Politics determines what kind of society we wish to live in and create and hand on to the next generation and it is politics that will make poverty history. It is also politics that helped him to institutionalize his monumental infrastructural developmental strides in the state. There is widespread recognition that politics is fundamental in shaping development choices, strategies, trajectories and outcomes. It thus involves change that must inevitably challenge established interests, and prevailing structures of power that has always held sway in the state. Oshiomhole realized that politics consisted of two fundamental levels. The first concerns the rules of the game, that is the procedures and processes which underpin and structure political life, which distributes power and authorizes it’s use in particular ways. The second concerns the games within the rules, that is the normal contestations over policy and power. Since in Nigeria, the fundamental rules of the game are not well established, it was incumbent on him to balance his desire to get a dependable ally to succeed him after his meritorious tenure with the delicate politics of the state taking into consideration ethnic and other considerations. Oshiomhole performed outstandingly as governor. It is not easy anywhere in the world to be a harbinger of change as even the people for whom change is intended often resist the change. Institutionalizing change and development in Edo State was done with the election of a successor who was part of Oshiomhole’s success story from the very beginning as Edo people could not accept a throwback to the dark ages. A shipwreck at that point would have been catastrophic for the Edo people. Those who lost out in the scrabble for political power and influence have made it a pastime these days to denigrate Adams Oshiomhole by engaging in character assassination, odious insults and throwing political innuendos and brickbats against him in the press and especially in the social media. This has only made the man more popular. He remains an issue in Edo politics more than a year after handing power to Mr. Godwin Obaseki, a very compassionate and versatile team player who has all the attributes to continue the developmental initiatives of Adams Oshiomhole. Since his successful handover of power, the Comrade Governor, as he is still fondly called has been involved in several speaking engagements and helping to build bridges of cooperation among the various ethnic and religious groups and communities in Nigeria. The post Oshiomole: The anatomy of a statesman appeared first on Vanguard News.